Sunday January 20th 1878 I hardly finished my share of the morning work till it was church time. just as I was ready to go Mollie came and she went with me. We heard an excellent sermon. I helped get the dinner over and in the afternoon Win came over and the boys helped us sing sacred songs. Ella and John came and all staid till after supper. In the evening some of us took Win home. Pottle and I went to church. We heard the very best of sermons. After all hands got home the boys had a big discussion in the sitting room. 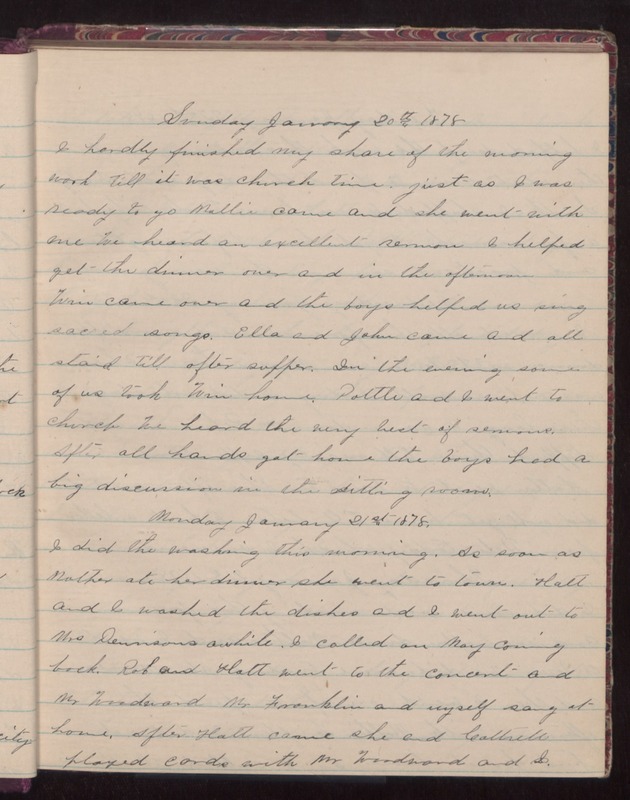 Monday January 21st 1878 I did the washing this morning. As soon as Mother ate her dinner she went to town. Hatt and I washed the dishes and I went out to Mrs Dennisons awhile. I called on May coming back. Rob and Hatt went to the concert and Mr Woodward, Mr Franklin and myself sang at home. After Hatt came she and Cattrell played cards with Mr Woodward and I.